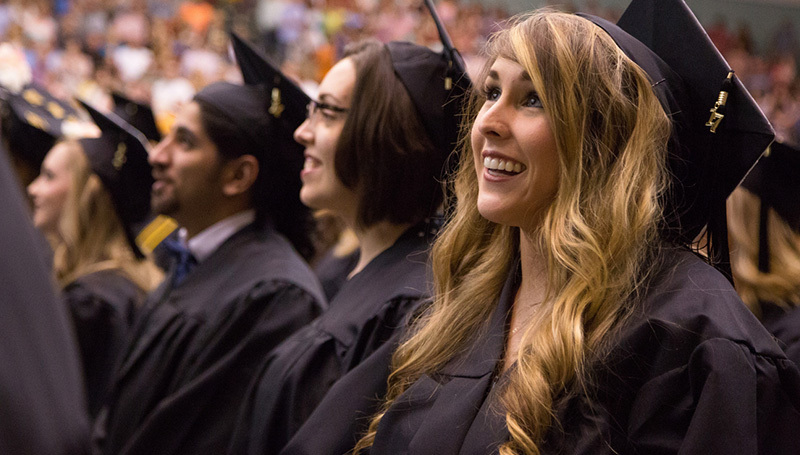 A total of 727 students will be awarded 862 degrees during 2018 Spring Commencement ceremonies set for Saturday, May 12, in the Leggett & Platt Athletic Center. The 70th graduating class includes 26 international students from 10 countries, as well as 39 students who will receive master’s degrees. Graduates from the Schools of Arts & Sciences and Health Sciences will attend the 9:30 a.m. ceremony. The ceremony for the Schools of Business and Education will be at 1 p.m.
Tammy Trent, the senior vice president and chief accounting officer at Leggett & Platt, will serve as the keynote speaker. A Carthage native and 1990 graduate of Missouri Southern, she followed her parents into the accounting field and is a Certified Public Accountant. Today, she oversees the accounting for Leggett & Platt, including 120 manufacturing sites in 18 countries. The ceremonies will be streamed live at www.mssu.edu. KGCS-TV will provide live coverage of the ceremony, which will also be rebroadcast at 7 p.m. Sunday, Dec. 17. The station is available on local cable systems, including Cable One, Mediacom and Suddenlink. DVD copies will be available for purchase. For more information, contact Judy Stiles at 417-625-9777.